Anyway it was my son's 9th Birthday the other week and he got some cash to buy what he wanted. Now, being a sensible sort of child he decided he'd like lego. In my (not so) humble opinion the best toy ever invented. No argument. So we go get our shots and venture into the local Toys R Us. (Don't get me started on TRU and the way their banal lowest common denominator product selection policies have bankrupted every other toy shop in town without actually stocking anything like as good a range as the shops they replaced.) Now TRU doesn't have the best range of lego to look at, but its either there or Argos, and call me old fashioned but I'd like to look at what I'm buying before parting with cash, and do not gain any kind of thrill at seeing my product hurled down a small conveyor at the back of the warehouse where marking something "fragile" seems to mean "Only thrown underarm!" 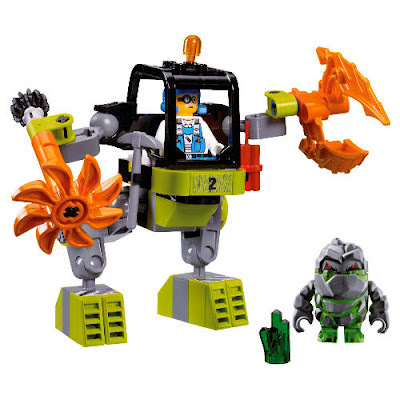 So, we're stood in front of a rack of lego and my son decides he likes the look of the Power Miners range. Well, he's only 9, so i decided it was a little churlish of me to point out that pointed mole drills are useless means of mining in anything other than soft earth, or that the so called "rock monsters" seem to be the innocent party defending their home against the invading and clearly imperialistic power miners who are intent on pillaging the rock monster's domain for crystals. "Ok," I say, "so what do you want?" knowing that he had enough money for a large set and perhaps a small one too. Well off he goes and adds up the prices and such like and comes back with a Rock Crusher kit - nice and big and suitably WOW to a 9 year old i think. Good choice! Except in his other hand he had another small model which he presented to me with a huge grin on his face. "I can afford this too Daddy!" "Oh." I replied somewhat crestfallen. "Why that one?" "Well Daddy, Its a walker robot and they are sooooooooooo cool!" ...I nearly choked when I read this post! You see...even children recognise the coolness of walking robots! Just because i am outnumbered does not make me wrong! I thought you'd enjoy that post Inso! I have to agree with the kids here (mine have some of the power miners too) walking robots are simply cool!